I'm finishing up replacing the water pump on my 86 951. When I started up the car and was checking for leaks, I noticed that the power steering pulley was wobbling. In fact it was so bad that the crankshaft bolt had worked itself to finger tight in about one minute of idling. I removed it and pulled off the power steering pulley. The pulley's round hole is now slightly oblong, and what appears to have been a lip that should have centered the collar/washer from the crankshaft bolt is no longer there. 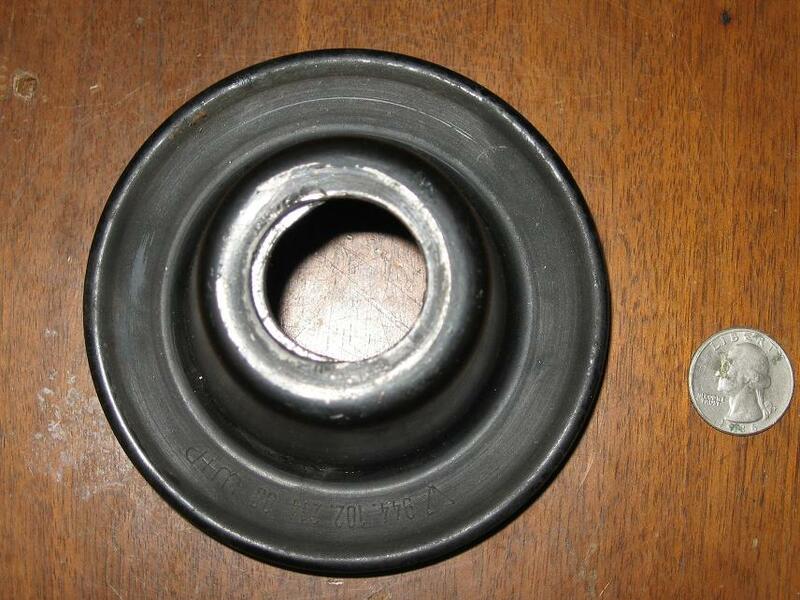 Question 1: Anyone have a power steering pulley that they can ship to 22903? Please PM me with a price including shipping and when you could send it out. Question 2: For cars that do not have power steering pumps (and pulleys) is the crankshaft bolt and collar/washer the same as those cars that do? In other words, can I put the crankshaft bolt in and run without power steering? I agree, it wasn't tightened *properly*, although it was tightened to 155 ft lbs. Any word on whether I can run (temporarily) without the power steering pulley using my existing crank bolt??? I'm not sure if you can do without it or not, but a substitute (like a machine washer) is available at any descent hardware store for like a buck fifty. Even the local true value has a collection. Don't the power steering pulleys have 4 10 mm bolts holding them in as well as the crank bolt? Maybe I'm thinking about something else. In any case, it you really only ran it for a minute or two, NO amount of runout on a pulley that weighs well less than a pound is going to loosen a bolt torqued to 155 fl/lbs. I wouldn't be worried about the wobble as much as about getting the thrust washer on in the right direction and making sure you actually get the bolt tightened down the way it needs to be. I drives your oil pump, so it's really important. In fact, I'd suggest pulling your DME relay (to prevent the car from actually starting) and cranking the car once its back together and before you try to start it for real. Within 10 or so rotations you should see your oil pressure build. Probably much sooner if you haven't had it down for too long. If it doesn't build pressure, don't try to start the car until you figure out what's wrong. There were a few variants of that pulley. Post a pic of the yours and I may have one for you. when i pulled my engine out i noticed that the crank bolt was so loose that the powerstearing pully was not moving at all and just wobling around. You're thinking of the alternator pulley. I think what happened is that the pulley wasn't on straight and as I torqued the bolt down I was deforming pulley. I'll post some pictures. Yikes. I'm not liking the idea that I ran for a minute or two without oil. Note how the hole is no longer round, and also how there is a lip on one side and not on the other. I think you're right on that one. That makes a lot of sense. If you deformed the pulley while you put it on, and it finally slipped, what happened makes total sense. I wouldn't stress a couple minutes it idle without oil pressure. You just put 10k miles on it Seriously though....pull the DME and make sure next time. It's an easy double check to not have to stress over one more thing on your first start up after doing major work. You're already stressing every noise, and even weather it will start up or not. Make it easy and know you're gonna hove oil first so you can concentrate on stressing out over the other stuff. Edit: like Bruce said: you know how thick the pulley is. Go find a washer that thickness that fist over the crank bolt and you should be fine until you come up with another P/S pulley. Many of us here are running de-powered ps racks for years. I don't even have a reservoir or pump on mine anymore. Just get the crank spacing right (just in case - it might not even matter, but its not worth it over one trip to the hardware store and $0.49 worth of washer) and get it back together if you don't want to wait for a pulley. I was starting to think there was some kind of special vortex in my garage and I was the only one who ever bumped into this problem. "I was driving along and my power steering belt just went flying." "I don't know why but I've had to replace that little PS pump adjusting strut twice, the thing is a POS. 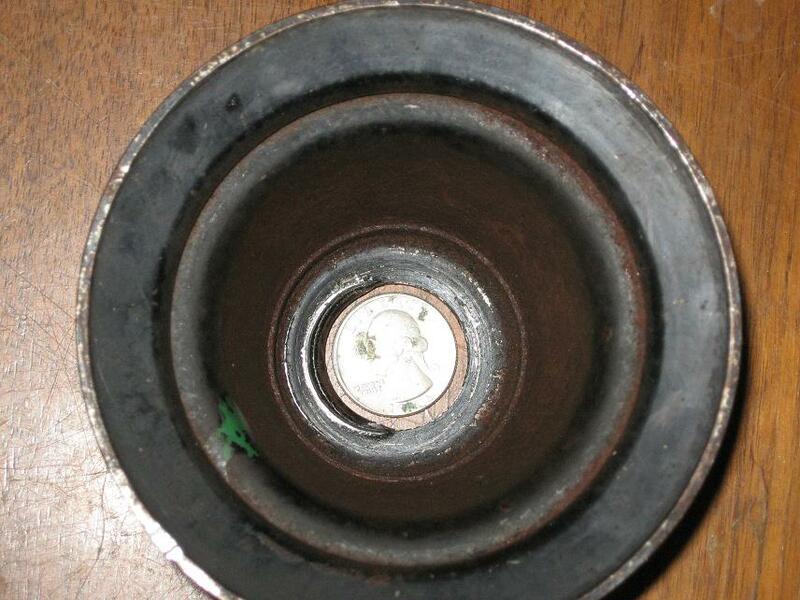 Once the PS pulley broke clean off." "Every now and then I hear this tapping noise and I think my oil pressure guage might be going bad too." i prob have a pulley if no one else does. Great! Send me a PM and let me know how much to ship it to 22903, and how I can pay you (paypal?). You can run without the pulley. Be sure to check that the washer is on correctly. The stepped side goes towards the crankshaft. This is very easy to do. Next time, be careful with the crank bolt. Thread it in by hand while you are holding the pulley on the crank nose, and double check it before you put the gorilla grunt on it.